Carey Baptist College in Auckland offers a range of courses in pastoral and youth training. The tertiary institute is committed to providing the very best theological programme to equip its students for a lifetime of fruitful Christian ministry. In keeping with this, it commissioned Grafix Wall Art to recreate the Treaty of Waitangi on its lecture theatre walls. 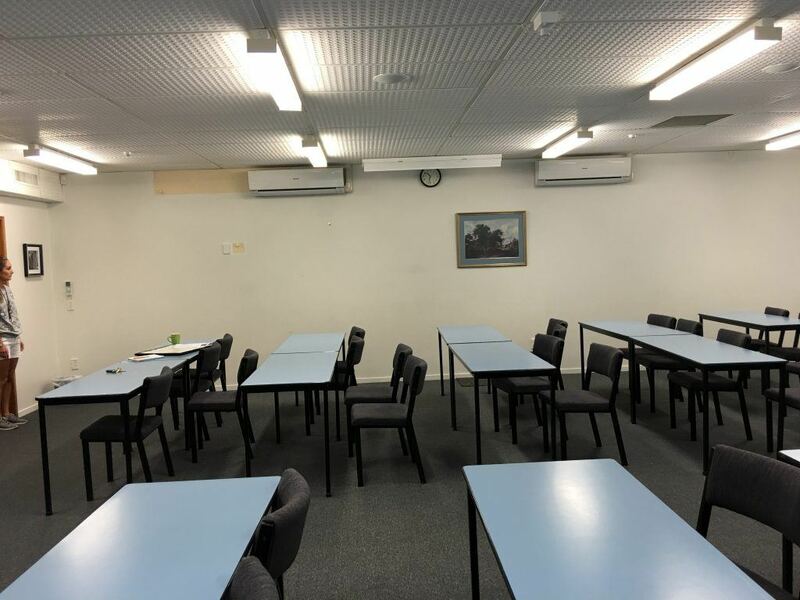 “After completing a course about church history in Aotearoa, the students requested that the Treaty be placed on their lecture theatre walls,’’ says Carey Baptist College executive director Chris Berry. 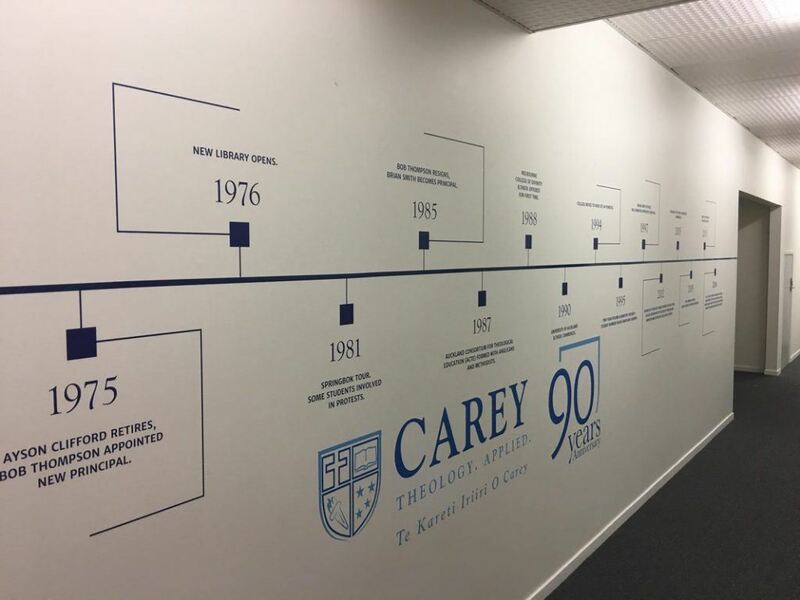 The college then went one-step further and to recognise it’s 90th Anniversary they designed a timeline that Grafix Wall Art then implemented and brought to fruition. 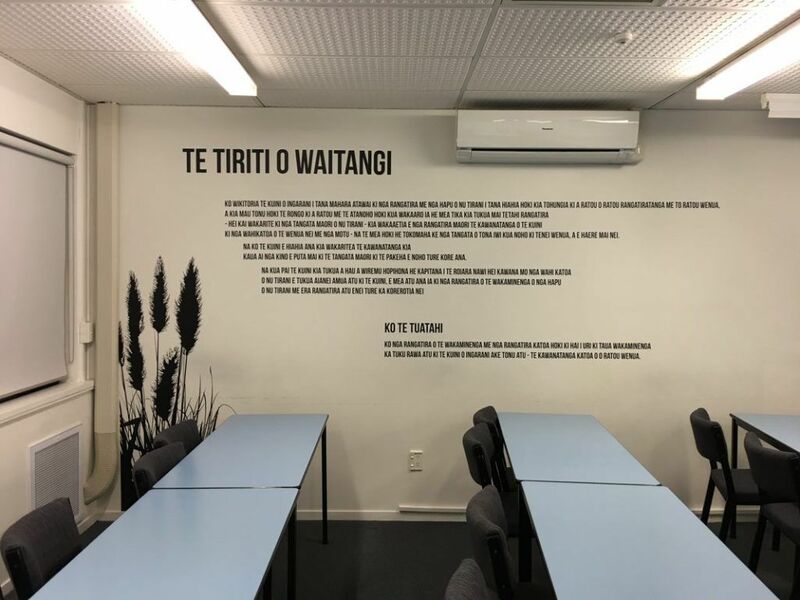 The college had previously worked on some simple signage for its wharekai (kitchen) back in 2016 so it already knew that Grafix Wall Art could meet the brief, which it supplied via a simple email. First of all, photos were taken of the room and super imposed with the proposed graphics so the Grafix team could make best use of the space available. These pictures were then sent to the client so she could see what the finished product would look like and approve the creative concept. 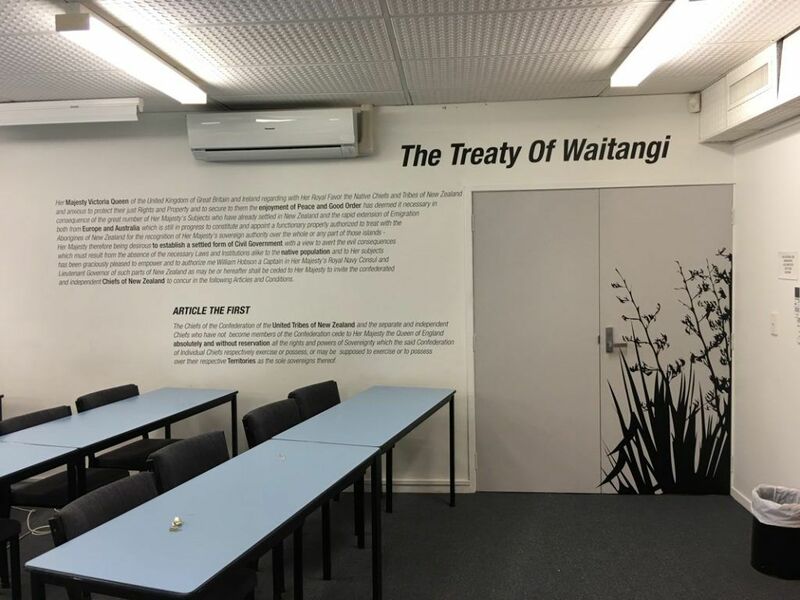 To create the wall art, Grafix scanned the Treaty articles then created two sets of customised decals made of black stick-on-vinyl. Graphic elements – striking black and white images of native toi toi and flax – were used on the doors to provide continuity and visual interest. Grafix was also commissioned to produce a massive timeline to celebrate the school’s 90th birthday. 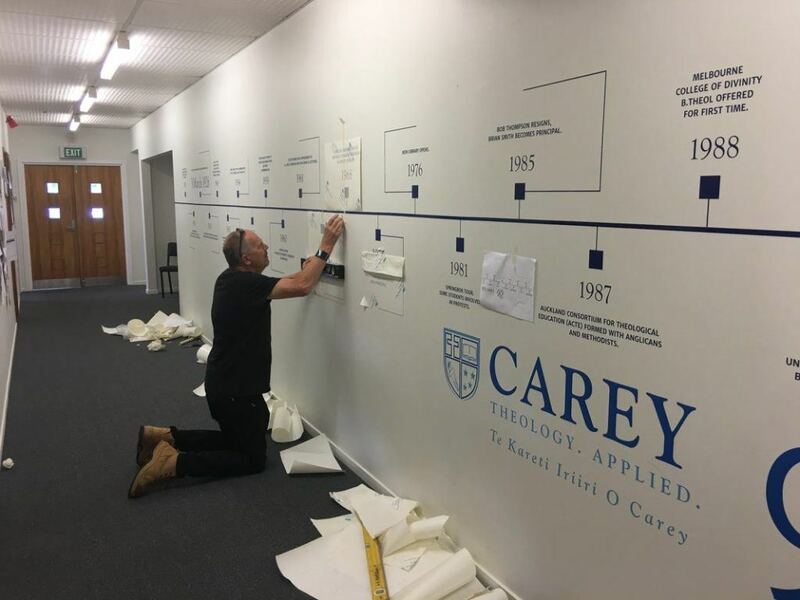 Of course, the most important part of the installation was to ensure the art work was straight, so to accurately position the 10-metre timeline the Grafix team used laser levels. Grafix Wall Art delivered on time and on budget – with the entire project, including installation – costing under $2000. And Carey Baptist College is pleased with the impact the wall art is having. “Most of our classes are taught in the lecture theatres where Te Tiriti o Waitangi is displayed across the two side walls in both Te Reo and English,’’ Chris Berry says.